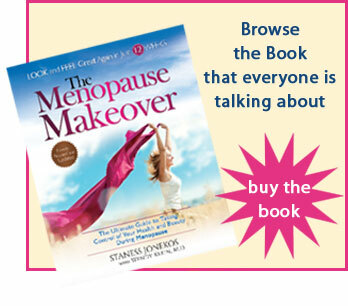 Bladder health is important at any age, but most of us don’t think about it until we approach the menopausal years. 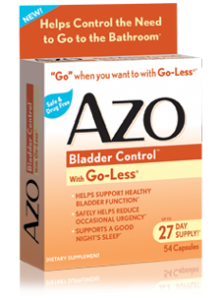 AZO Bladder Control™ with Go-Less® is an option to consider to support a healthy bladder. There will be 5 winners selected for the AZO Bladder Control™ with Go-Less® giveaway. It’s easy to enter. Leave a comment that you want to win, or “Like” our Facebook page. The winners (randomly selected) will be announced September 30, 2014. The active ingredient in AZO Bladder Control™ contains clinically-studied Go-Less®, a drug-free, naturally sourced supplement comprised of pumpkin seed extract and soybean isoflavones. These ingredients are shown to support healthy bladder activity and enforce bladder strength. Pumpkin seed extract supports bladder muscle integrity, while the soy isoflavones help relax bladder muscles and sustain muscular strength in the pelvic floor. Take one capsule three times a day for two weeks. After two full weeks, taper to one capsule twice a day. 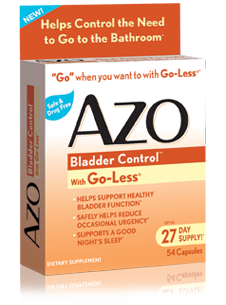 When following the suggested product directions, AZO Bladder Control with Go-Less helps to manage occasional urgency. Always discuss over-the-counter-products with your healthcare provider.